Yesterday’s chart showed the part of our Milky Way galaxy that stretches overhead in the evening. Today’s chart is aimed toward the galaxy’s center, which is located some 30,000 light-years away. Remember, when you are looking at this starlit band across the sky – visible from country locations – you are peering edgewise into our own galaxy. Today’s chart shows that the starlit trail of the Milky Way seems to bulge just before it reaches the southern horizon. This bulge marks the approximate location of the Milky Way’s center. 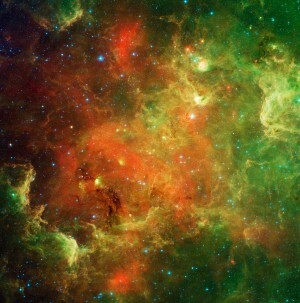 This part of the Milky Way is vastly more spectacular in a dark night sky than it appears here on our chart! 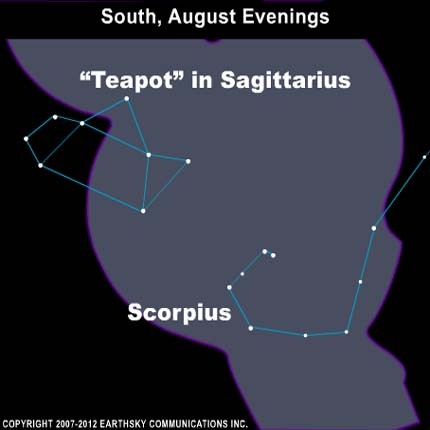 The constellations Sagittarius and Scorpius lie in this direction as well. Can you show me a detailed view of the Milky Way center? With the moon still mostly gone from the evening sky, this is an excellent time to trek out to the country for an edgewise view into our own galaxy, the Milky Way. So take advantage of the moonless skies in the evenings this week, and go stargazing. If you have them, bring along a pair of binoculars. If you scan with binoculars along the Milky Way, you will find many lovely clusters of stars. No need to know their names to enjoy them!